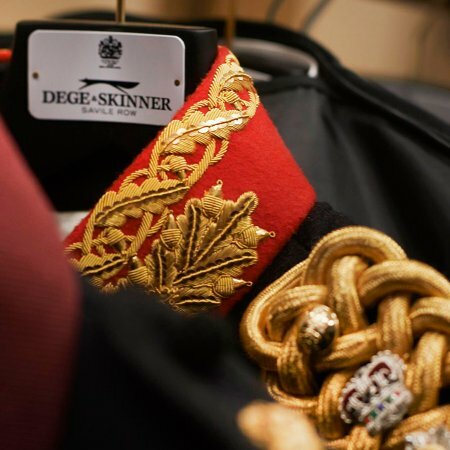 Dege & Skinner has been a prestigious name on Savile Row since 1865. They hold a Royal Warrant to HM The Queen, are still proudly family owned, and were a founding member of the Savile Row Bespoke Association with their Managing Director currently the Chairman. Dege & Skinner is also the only tailor on the street to have a permanent shirt-cutting service in their workshop. 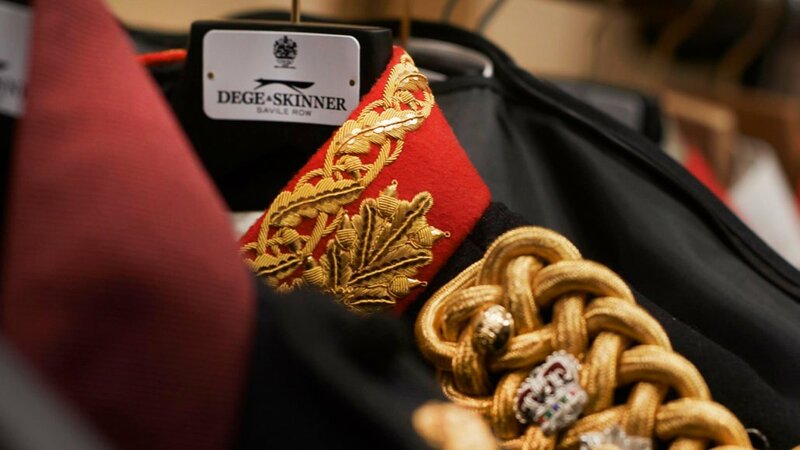 Alongside bespoke tailoring, they also provide military uniforms and conduct personal fittings at the Royal Military Academy in Sandhurst which has trained many of the Royal family. They had the honour of making the military attire for Prince William and Prince Harry and a photograph of them in their uniforms hangs in the National Portrait Gallery in London. Their importance in the world of military tailoring has also been recognised by the capital’s world-famous decorative arts museum, the V&A, who has previously borrowed pieces for exhibitions. 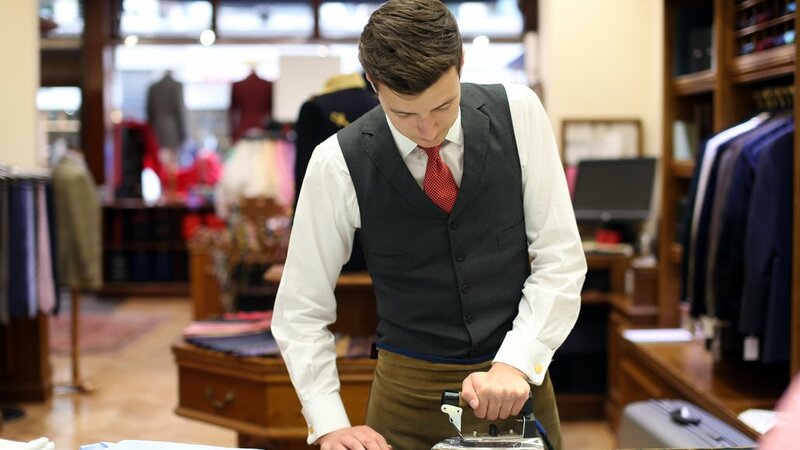 Though they regularly make trips abroad for appointments with their international clients, you can be assured that all of their bespoke clothing is designed, cut, and made at 10 Savile Row. Their background in military and equestrian wear has a subtle influence on their house style and everything is intended to make their clientele stand at their tallest. An intensive 60 hours goes into the making of one of their three-piece suits, or 55 hours for a two-piece suits and 40 hours for their bespoke coats. A ready-to-wear line was introduced in 2016 and covers men’s blazers and suit jackets, shirts, trousers, ties, belts, scarves, cuff links, socks and more. A range of club ties are also available and if you need something made up specifically for your club, they’ll only be too happy to oblige. Usually The Row’s tailors are strictly boys clubs, but Dege & Skinner welcome women to enjoy the benefits of the bespoke experience too. 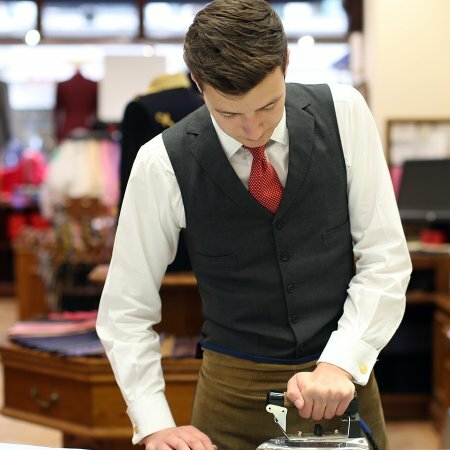 Whether you’re after business attire, formal country wear or a hand-cut shirt, it’s all under the same roof.